The Namco Noir 32 Inch LCD Arcade Cabinet is the perfect HD terminal for 2 player gaming. Compact in size, it features a 32 Inch High Definition LCD wide screen from Namco. The LCD screen also comes with HDMI and VGA connector. 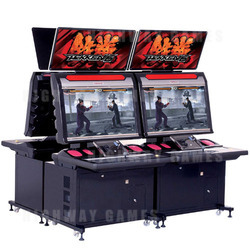 This popular sitdown Cabinent is often used with 2 player fighting games, such as the Tekken series, but can work great with a wide variety of games.